Located in the historic centre of Angers, on an ancient and medieval site, the Musée des Beaux-Arts d’Angers is made up of several buildings from different époques, constructed at various stages down through the centuries. 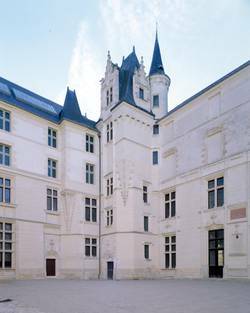 Comparable to the Hôtel Jacques Coeur [private mansion] in Bourges, this sumptuous residence was built for the banker Olivier Barrault, treasurer to the king and mayor of Angers. 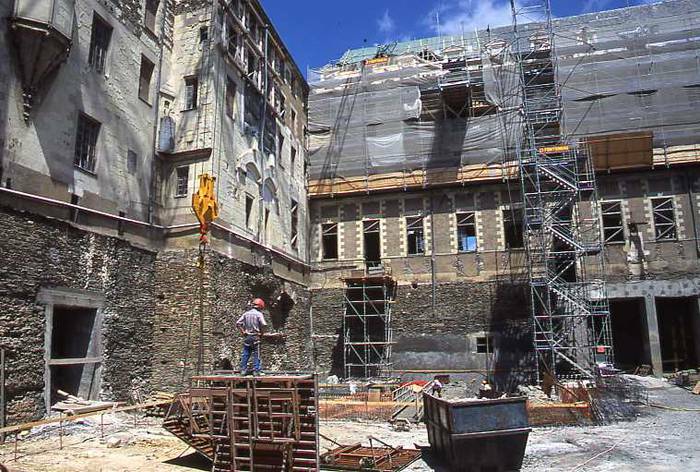 Prior to the Italian wars, the façades illustrate the splendour of the then dwindling Flamboyant Gothic style, whereas the design of the courtyard and the garden are synonymous with the French Renaissance-style. The two residential wings are linked by a beautiful staircase tower, the chambers at the top of which highlight the social prestige of the former owner. In 1673, the ‘Great Seminary’, a training college for priests, was established within this residence and extended it. 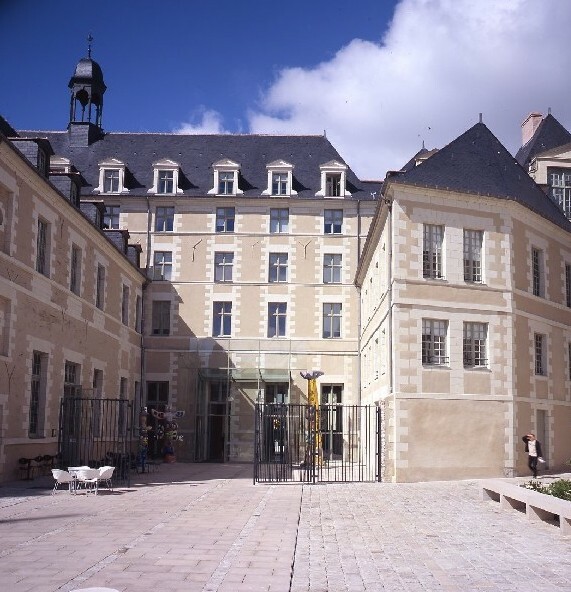 Confiscated during the Revolution, the building was home to the École central de Maine et Loire during the Revolution, and later to the museum that opened here in 1801. These allocations brought about the removal of the high roofs and skylights for the benefit of two additional floors and glass roofs. But the beautiful doorways, the finely worked, bevelled squinches and the masterly-crafted window frames on the ground floor of the left wing still bear witness to the quality of this imposing former residence. 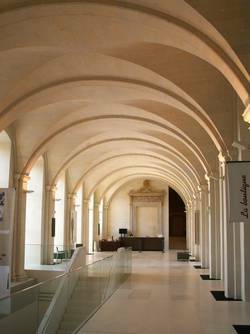 When you enter the ground floor of the museum, the vaulted hall, the current passage des musées is sure to attract attention. This space was originally designed as a ceremonial room, ‘to receive and host one’s friends and other goode people’, as the master of the residence himself, Olivier Barrault once said. Like the Château du Plessis-Bourré, the Logis Barrault had two halls, one of average size, with a ceiling which was used for everyday activities (this hall has since disappeared), the other hall was vaulted and its large spaces in the rear wing were reserved for special occasions. Well-lit by four tall windows overlooking the courtyard and the garden, this hall is distinctive for its elegant groin vault with liernes and tiercerons, whose oblate profile is a technical feat, breaking with the usual Gothic verticality. This huge nave with eleven bays served as the refectory of the great seminary. 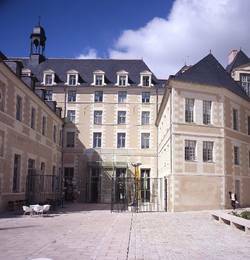 It occupies the entire ground floor of a large part of the building built in the latter part of the 17th century, on the site of the ‘Petit Barrault’, as part of the larger Barrault complex. It is a fine example of classical architecture, monumental and austere, with a single scansion of Doric pilasters supporting the groin vaults. 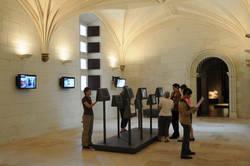 From 1839 to 1984, date of the opening of the Galerie David d’Angers in the neighbouring Toussaint abbey church, this space housed the superb collection of works donated by the aforementioned Angevin sculptor. 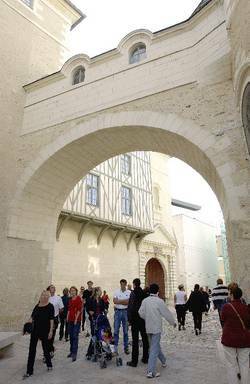 The capstone of the main doorway, connecting the refectory to the Logis Barrault still bears a statuary medallion portrait. 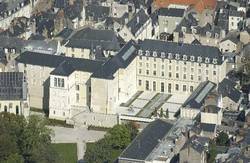 After five years of extensive renovations, improvements and extensions (1999-2004), the new look Musée des Beaux-Arts d’Angers reopened its doors to the public in June 2004. Architect, Antoine Stinco, specializing in museum interior design was entrusted with the task of transforming the museum’s spaces in accordance with the head curator’s wishes to marry the collections on display to the diversity of the architectural spaces. This concept is particularly apparent throughout the museum, where each room takes on a particular atmosphere, lighting or colour. 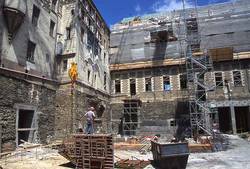 The restoration of the exterior of the museum and the Logis Barrault was entrusted to Gabor Mester de Parajd (an architect specializing in Historic Monuments) who respected the historic and architectural references of the site. The aim of this project was to showcase the identity of each époque, all the while harmonizing the ensemble of buildings. 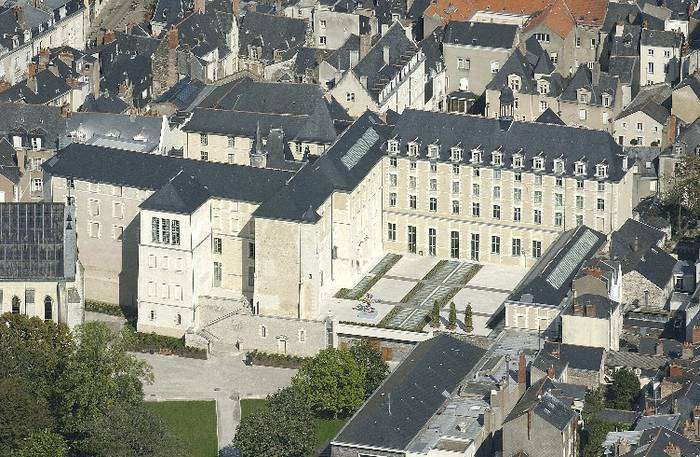 Larger and more functional, the new museum offers 3,000 m2 of exhibition space, occupied by two permanent collections: Beaux-Arts [Fine Arts] (350 paintings and sculptures from the 14th century to the present day) and Histoire d’Angers [The History of Angers] (550 archaeological pieces and objets d’art from the Neolithic period to the present day). The museum is also equipped with a 550 m2 temporary exhibition space, a graphic arts collection that highlights contemporary artists and heritage displays. The museum also boasts an auditorium space. The museum’s 1,000 m2 space for the reserve collection allows these items to be safely stored in the best possible climatic conditions. Two hundred years after it first opened as a municipal museum (1805), this site combines history and creation, in an ultra-modern visitor-friendly museum.